The aim of this chapter is to contribute to the development of a theory of organizing HRD that can help to analyse and support organisational practices around professional development, by showing that employees can operate strategically in several ways when it comes to organising HRD. The chapter first describes two major changes that are to be expected in organising professional development, which have far-reaching implications for the roles of employees. First, a shift from a didactical to a strategic role and, second, a shift from directing their professional development individually to doing so with a network of actors. The chapter continues by presenting an employee perspective on organising professional development, which holds several ways for employees to operate strategically. The learning-path cycle is introduced, which explains how employees create their own learning paths in the context of existing learning networks and structures. From the learning-path cycle, three access routes are identified for employees to operate strategically: following existing structures and actors, aspect-based strategic operation, and integrated strategic operation. 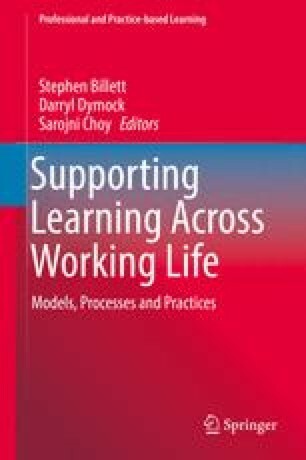 The chapter also discusses existing empirical research about employees’ professional development strategies and confronts the results with theory. The extant research reveals that employees above all follow the existing structures and actors, and to a limited degree operate according to particular aspects. There was almost no evidence of integrated strategic operation. In further developing ideas on employees operating strategically within organisations, it should be assumed that in the learning-path cycle employees operate mainly according to ‘following’ and ‘aspect-based’ strategies. The chapter finishes with a number of suggestions for further research into employee strategies for organising professional development.